Australia was once a world leader for laptop adoption in schools. Now overtaken by extensive roll-outs of laptops in Maine and Uruguay, this paper seeks to explain why this lead was lost. 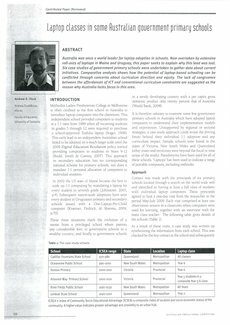 Six case studies of government primary schools were undertaken to gather data about current initiatives. Comparative analysis shows how the potential of laptop-based schooling can be conflicted through concerns about curriculum direction and equity. The lack of congruence between the affordances of ICT and conventional curriculum constraints are suggested as the reason why Australia lacks focus in this area.